Study reveals even if migration is halted, Muslim population will continue to gorw. By mid-century 7.4% of Europeans will be Muslims. 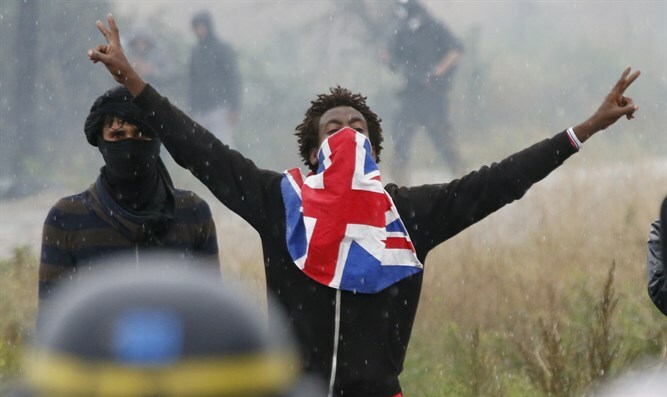 Migrant reacts near French riot police during protest near area known as the "jungle"
The Muslim population in Europe will continue to grow in the coming decades even if migration to the continent is completely halted, according to a Pew study published Thursday by Ynet. The Institute tried to estimate the number of Muslims living in Europe in 2050, using three different immigration scenarios. According to the scenario in which Muslim immigration to Europe ceases altogether, by 2050 there will be 30 million Muslims in Europe, and they will be 7.4% of the continent's population. According to the researchers, the main reason for this is that the average age of Muslims in Europe is 13 years lower than that of other Europeans, and their birthrate is higher. In a scenario where Muslim immigration to Europe continues but tapers, 58.8 million Muslims will live in Europe in 2050, and they will be 11.2% of Europe's population. This prediction is based on a scenario in which "normal speed" migration, defined by the Pew Institute as immigration whose motives are economic, educational, and family,is the norm and not asylum-seeking refugees. In a scenario in which Europe faces high immigration rates - that is, a renewal of the immigration trend at a rate as high as that in Europe in 2016-2015 - in Europe, some 75 million Muslims will live in Europe in 2050, and their proportion in the population will be 14%. In any event, the research institute states that even in a scenario of very high rates of immigration of Muslims to Europe, Muslims on the continent will still be a much smaller community both than the European Christian community and the European community that does not belong to any religion. The migration of Muslims to Europe is a politically sensitive issue on the continent, especially since the massive wave of immigration that swept through Europe in 2016-2015. In some countries there have been large protests against the arrival of Muslims, and political parties opposing Islam have gained strength. The study published today covers 30 European countries - 28 EU members as well as Norway and Switzerland. According to the study, not all countries will be affected by future migration. In a high-migration scenario, the sharpest increase in the number of Moslems will be in Germany and Sweden, because they are the two countries that absorbed the largest number of asylum seekers in the wave of immigration that swept the continent two years ago. Last year, Muslims accounted for 6% of Germany's population, and in a high-immigration scenario in 2050 they will account for 20% of the population. In Sweden, their rate was 8% in 2016, and in a high-rate migration scenario their rate would be 31% in 2050. On the other hand, in countries where there are relatively few Muslims in 2016, only a small Muslim community will continue to exist in 2050 in each of the three scenarios.